Mildred Calhoun Simmons, aka "Bum-Bum", 88 years young, passed away on Saturday, February 9, 2019. She was born in Alabama, but lived most of her life in Florida. She came from a large, loving family, and they are all reunited today. Her dad was the former mayor of Ocoee, where she attended Ocoee High School and was captain of her basketball team. Her nickname was "Ram". She was the biggest Orlando Magic fan, watching all their games and proudly flew their team flag. She was married to Miles Simmons who preceded her in death three months ago. 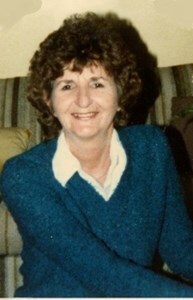 Mom loved her buttermilk, her grandkids who called her "Bum-Bum" and who she taught to play poker. She loved driving her Mustang and was even known to race a little. To sum up her life is easy - She loved! We will miss you so much, Mom. Keep everyone laughing until we meet again. She's an angel, Lord, so let her fly. She is survived by her son, Jeff Simmons; daughter Pam Meadows, and son-in-law, Danny. She had six grandchildren, Jessee, Geoffrey, Lacey (Jay), Katey, Danny 2; six great-grandchildren; and was preceded in death by a grandson, Jared Simmons. Funeral services will be held on Saturday, February 16, 2019 at 10:00 at Liberty Baptist Church, 744 N Dean Rd, Orlando, FL 32825, with Pastor Vern Murray, officiating. Visitation will be at the church on Saturday from 9:00 am to 10:00 am. Graveside services will follow on Saturday at 1:00 pm at Woodlawn Memorial Park, Gotha, FL. To share your memories of Mildred or leave a special condolence message for her family, please click the Share Memories button above. Add your memories to the guest book of Mildred Simmons. Millie was my friend for over 50 years. Oops almost gave away my age!! We shared so many of life's ups and downs. It is so difficult to lose that friendship. One of our dreams was to run away together when one of us won the lottery! (Maybe Pam could fill in for her!? ) Will miss you so very much. Rest in peace my dear friend. Lacey - So Sorry for your loss - I Know you thought the world of her. Mom, losing you has been the hardest thing I have ever done. My deepest sympathies go out to the Simmons family. May you be comforted by the beautiful resurrection hope found at John 5:28,29.